Not everyone, however, was entranced by Pauling's protein spirals. In February 1951, the source of most of his research funds, Warren Weaver at the Rockefeller Foundation, sent one of his officers to Pasadena to check on Pauling's latest work. The sober, critical deputy, W. F. Loomis, did not fall under Pauling's spell. "He certainly is imaginative, daring and brilliant," Loomis wrote in his diary. "But he has gone off the deep end in some cases (such as the 'artificial antibody' story) and his many stimulating pictures, models, etc. may be largely figments of his own imagination rather than lasting and sound science." 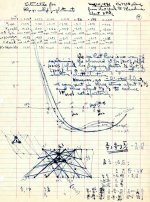 In fact, Pauling, enthused by the positive reaction of the Caltech crowd, was preparing to publish ideas that still fell far short of being proven. There was a chance that the Courtaulds data might represent nothing more than a peculiarity related to synthetic polypeptides. Perhaps it might mean little or nothing in the natural world. He still had no good explanation for Astbury's recurring 5.4 angstrom repeat. By moving ahead with his theoretical structures in the face of substantial conflicting data, Pauling was taking a chance that most researchers of the day would not. Bragg's group, for instance, never would consider tossing aside x-ray data. But Pauling moved ahead anyway. Perhaps he felt it necessary to take chances. Bragg's team was drawing ever-closer to finding the first detailed protein structures, and although they hadn't gotten there yet, the British might at any moment. The protein structure section of Pauling's laboratory was much smaller than Bragg's, Perutz's, and Kendrew's combined operations, with less equipment and fewer crystallographers. Pauling had Corey, of course, who was by himself an invaluable asset. But that might not be enough. If Pauling wanted to be first, he would have to substitute daring and intuition for laboratory muscle. And his intuition told him he was right. Get the Flash Player to see this audio player. See Also: "The Structure of Hair, Muscle, and Related Proteins." March 1951. See Also: "The Structure of Feather Rachis Keratin." March 1951. See Also: "The Pleated Sheet, A New Layer Configuration of Polypeptide Chains." March 1951. See Also: "The Structure of Fibrous Proteins of the Collagen-Gelatin Group." March 1951. 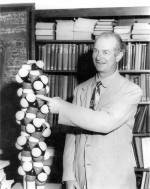 Linus Pauling gesturing toward a model of the alpha-helix. August 1954. "The Structure of Synthetic Polypeptides." March 1951.